Messy Messy Fail - My absolute FAVORITE coffee is a Dunkin' Donuts medium regular with pumpkin spice flavoring. We don't have a DD in our town so it's a special treat when we travel and I get to pick one up. Except of course when you pull over, you're all excited while you get out your gift card, pull up to the window and order, but you hear "Sorry we are all out of pumpkin spice flavoring for the season. Can I get you something else?" Drats. Tidy Victory - We had an opportunity to see The Good Dinosaur today (Saturday) with the UPKer in a nearby town while we were visiting my in-laws. What a terrific movie - excellent animation and graphics, beautiful music, wonderful themes about family and making your mark in life. I'll admit there were some heavy moments in the movie - my son commented on "Lots of storms" but it was really worth it, we'll be purchasing this one! Messy Messy Fail - Did anyone else miss the first episode of the 2nd season of Fargo like I did? Can't find it anywhere on the TV schedule, and being the outdated weirdos that we are we have yet to figure out the whole Amazon Prime free streaming thing. I'll just add it to the list I guess. And keep searching online for that golden first episode. Tidy Victory - I found them!!!! All the missing pieces to our Candyland game that is. The UPKer does enjoy playing it, but it's even more of a game to try keeping the entire thing together in one box. My solution - ziplock bags! 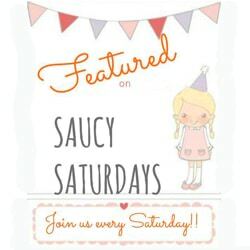 Welcome back to another great weekend at Happiness is Homemade!! Messy Messy Fail - When we dug up most of the landscaping in the front of the house to preserve and replant after the front yard revamp (will be posting! ), we got everything back in the ground EXCEPT one last dwarf Alberta spruce. It's currently leaning with it's giant rootball on the side of the snowmobile trailer. My husband and I cannot decide on a place to plant it, the snow is really going to fly soon and I HATE being wasteful! I may just drop it in the center of the front yard to plant it. Except my husband might kill me. Messy Messy Fail - For his birthday, the UPKer got a wooden train with paint set, like a DIY decorating kit. 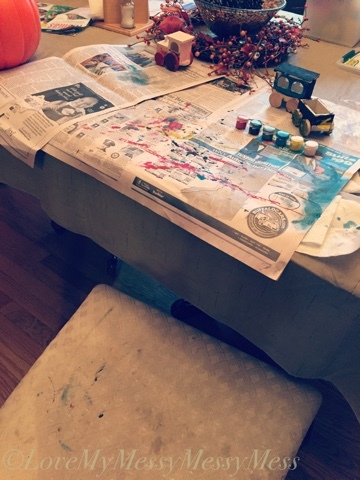 I laid out the newspaper, showed him how to dip his brush GENTLY into the paint, clean the brush in the little yogurt container of water when he wanted to change colors, etc. He was doing awesome until he used a sponge brush I had out which was too big for the paint pot and made it come flying out everywhere. Not to mention wiping his hands on the seat of the dining room chair. It was one of my summer goals to reupholster those anyways. Tidy Victory - While the toddler was taking his morning snooze, the UPKer and I got outside in the 32 degree weather with our boots and jackets and cut back a bunch of the garden. This is happening quite late this year, typically I clean it up in October, but other priorities came first. All hanging baskets = dumped, fairy garden = collected and packed away, MOST plants = cut back. Just one more dwarf alberta spruce to plant before the ground freezes and we are all set. And now, are you ready to party?!?!?!?!?!?! Messy Messy Fail - Because I'm frugal (cheap! 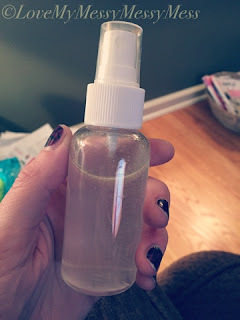 ), I take the Bath & Body wallflower out of the wall outlet in our bedroom in the morning so I am not wasting the oil making it smell nice during the day while we are at work. I typically just place it upright in a basket on my husband's nightstand. I hear "Katie there's a mess in the bedroom"......the wallflower has overturned the wallflower and it has leaked all over the shelf. 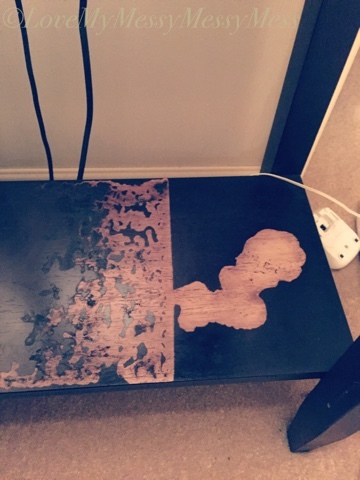 The oil even completely REMOVED the varnish from the furniture and made the bottom of the phone charger all sticky and melted. Nasty warm sugar smelling mess! Tidy Victory - I had to get the boys out of the house and to daycare on my own this morning - I woke up only 15 minutes earlier than usual and somehow managed to get out of the house THE EARLIEST EVER. It was shocking. 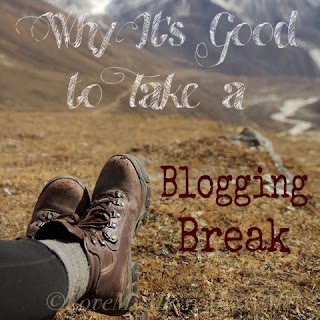 Let's see if I can do it again on Monday! Messy Messy Fail - It's nearly 12:30 on my Friday night and I'm finishing this post. I'll pay for this tomorrow surely. I am a night owl. Tidy Victory - The UPKer ate the leftover Chinese from yesterday for dinner! I promised a pretzel from Auntie Anne's at the mall if he ate it all. Whatever works. Messy Messy Fail - Quick trip to my hometown with the boys to chaperone a music festival and I forgot to bring the second most vital item - the Thomas the Train whistle. Every night before the UPKer goes to bed, we watch a quick 10-minute Thomas episode while he drinks his milk. He sings along with the jingle at the end of the show and blows on a little plastic train whistle that Santa brought a few years ago. Not having the Thomas the Train whistle rather ruins the whole bedtime process. Tidy Victory - I finished my awesome ornament for the 2015 Ornament Exchange being hosted by Erlene at My Pinterventures. I will be revealing the ornament I made with a tutorial on Tuesday, coming up real soon. 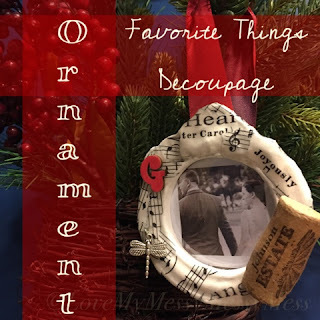 In the meantime, click here to see the beautiful ornament bought by my partner Rhiannon from Insolence and Wine for me along with the other bloggers who posted in her group. 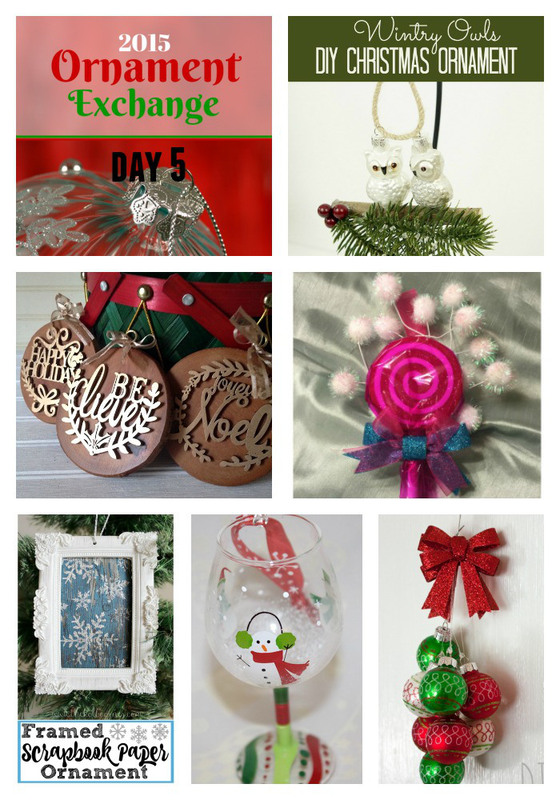 Mine is the adorable snowman wineglass! 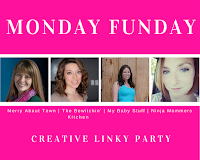 Welcome back to another great week with us ladies! 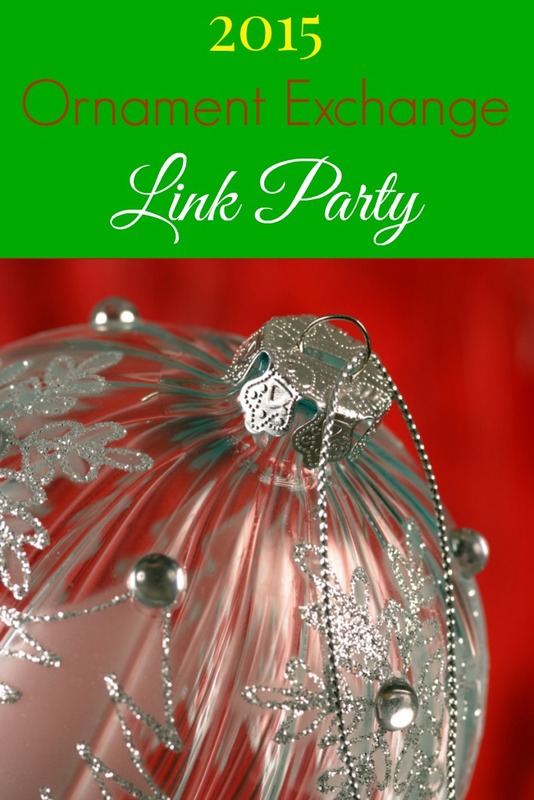 We had a great turn out last week and it is so fun to watch, how our link parties go with holidays and the weather..I feel inspired and now hungry!!! 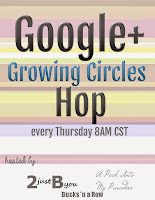 Don't forget since its a new month we have new co-host's so make sure you take the time to visit and say hello! Messy Messy Fail - Successful 4th birthday party with the UPKer today. For sharing with his friends at school tomorrow, I ordered 30 blue and yellow (minion!) cupcakes from Sam's Club that I ALMOST forgot to have my husband pick up before 6 PM today. Remembered in just the nick of time only to have the toddler pull the box off of the table and face down onto the floor. I managed to save them, minions aren't neat creatures anyways. 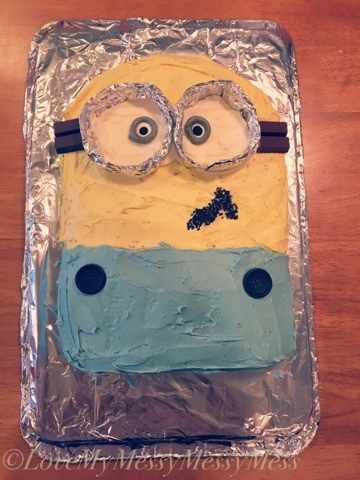 Tidy Victory - The minion cake I made for our family party actually turned out okay! Totally ended up winging this one and ran out of blue food coloring, but all in all I was quite pleased. Nothing more fun than making a cool cake! 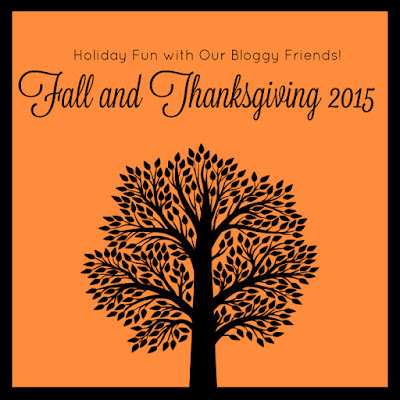 And now we interrupt our regularly scheduled program for ANOTHER awesome round up with some awesome bloggy friends. Check out our collaboration for fall and Thanksgiving themed posts!